Radio420™: Lex The Hex Master to Headline the UK Juggalo Weekender 2019! 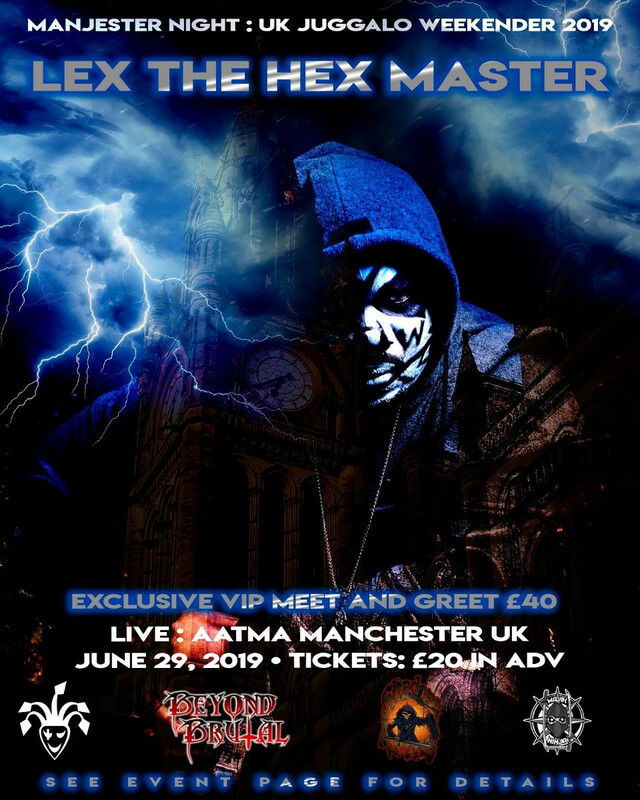 Lex The Hex Master to Headline the UK Juggalo Weekender 2019! The 9th Annual UK Juggalo Weekender is shaping up to be the biggest one yet! For those of you UK Juggalos who aren’t in the loop, let me fill you in. The homie Sez 2 Dope has been crafting the details behind this annual event this year and staying super secretive about it. We did find out that our homie Sewerside would be on the bill, which already makes it fresh! The headliner was just announced today, and that is none other than Majik Ninja Entertainment‘s own Lex The Hex Master! I know that Juggalo shows in the UK are few and far between, so this is a HUGE announcement, and I hope that anyone within a few hours of Manchester makes it a point to be there! Here’s the official flyer for the event. As the flyer says, it is taking place on June 29th, 2019 at AATMA in Manchester. Tickets are £20 in advance, and there’s also an exclusive VIP Meet & Greet for £40! This is an 18+ Only event, and doors open up at 5 PM with the party lasting all the way through 4 AM! To get your advance tickets and VIP meet and greet, just go to THIS LINK. Lex and I have been texting back and forth about this and he is BEYOND HYPE about this! You should be too! Mark your calendars and don’t miss it!